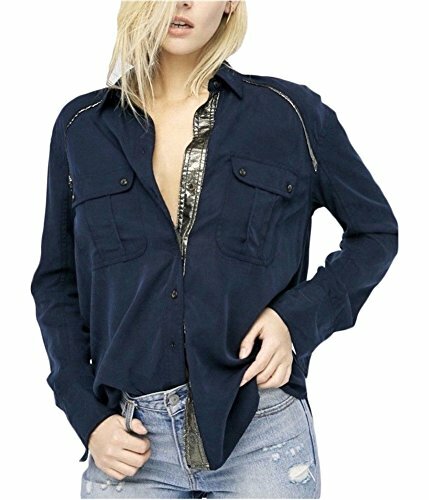 Free People Women's Size Guide Enhance your look with the fancy feel of this Free People™ Off Campus Button Down. Lightweight top boasts a contrasting trim that offers a luxurious shine. Spread collar. Long sleeves with double-button cuffs. Full button-up front. Chest pockets with double-button flap closure. Gathered details at the back yoke. Shirttail hemline. 100% TENCEL® lyocell. Machine wash and tumble dry. Imported. Measurements: Length: 31 in Product measurements were taken using size SM (Women's 4-6). Please note that measurements may vary by size. Enhance your look with the fancy feel of this Free People™ Off Campus Button Down. Lightweight top boasts a contrasting trim that offers a luxurious shine. Long sleeves with double-button cuffs. Full button-up front. Chest pockets with double-button flap closure. Gathered details at the back yoke. Shirttail hemline. 100% TENCEL® lyocell. Machine wash and tumble dry. Imported. Measurements: Length: 31 in Product measurements were taken using size SM (Women's 4-6). Please note that measurements may vary by size.